Sitecore’s Web Form for Marketers module comes with its own analytics, in addition to those provided by Sitecore. 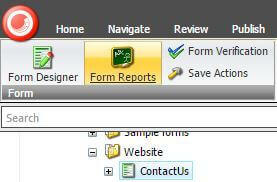 You can access those analytics by highlighting a particular form and clicking the ‘Form Reports’ button in the Content Editor ribbon. See the screenshot below. Various useful reports are available such as a Summary, Engagement Analytics, Dropouts, Usability, and Save Failures. However, these reports may fail if you miss one small step during installation of the module. When you install the module, the release notes specify that you have to run a script on the Analytics database of your Sitecore installation. If you forget to do this, you may get errors that specify certain tables are missing (e.g. dbo.Fact_FormEvents or dbo.Fact_FormSummary). No problem if this was missed, you can find the script in Sitecore’s data folder. For our particular scenario, we were using WFFM 2.5 and the file was called WFFM_Analytics.sql. Simply run this script on your Analytics database and the appropriate tables will be created and the errors should go away. You’ll also see the reports start populating with data once the forms are used.